Italian breadsticks, also called Grissinis, look great on the appetizer table. 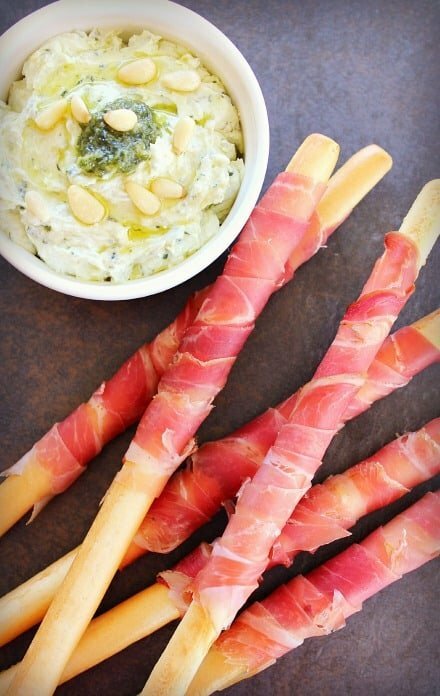 But they taste even better wrapped in prosciutto and paired with a delicious dip. For a fun presentation, you could serve the Prosciutto Grissinis standing up in a glass with the creamy pesto dip off to the side. It takes no time at all to wrap the bread sticks for dipping. I toasted them just for a few minutes in the oven to help the prosciutto kind of shrink around the grissinis and add a little crispy texture (this step is optional). If you’re not a fan of prosciutto, you could use black forest ham or even roast beef. Just ask your deli to slice the meat super thin. Wrapping the sticks is easier if you cut the meat into 1-inch wide strips and wrap multiple strips of the meat until the bread is covered as far down as you want. I wanted the creamy pesto dip to have lots of flavor but not be overpowering. Adding the basil pesto alone was a bit bland so I figured I’d increase some of the key flavors that go into the pesto. Adding enough extra lemon juice and zest, as well as Parmesan and extra pine nuts put the flavors over the top and the added lemon makes for a super fresh taste. Prosciutto Grissinis with Creamy Pesto Dip is a great party appetizer or a delicious first course. Change it up depending on your party theme. For a Mexican theme; instead of the prosciutto, use roast beef and for the creamy dip, switch out the basil pesto for chopped jalapenos, use cheddar instead of Parmesan cheese and omit the pine nuts. Use creamed avocadoes in place of the cream cheese and sprinkle with red pepper flakes. Effortless and elegant, these prosciutto wrapped breadsticks are flavorful and take no time at all. The creamy pesto becomes even more flavorful with added pine nuts and Parmesan, even though those ingredients are in most pestos. Serve immediately or make ahead and refrigerate. Take the bread sticks out of the package. Leave whole for a fun presentation, or break in half if you want prosciutto to cover the entire stick. Cut the prosciutto into strips approximately 1 inch wide and wrap around the end of each grissini. Keep adding strips until bread stick is covered as much as you want. Place prosciutto-wrapped sticks on baking sheet and heat just enough to shrink up the meat so it adheres to the bread stick and crisps the edges of prosciutto a bit. Only heat them for about 5 minutes. Watch the bread sticks so they don't start to burn. If making the grissinis ahead of time, bake them first, refrigerate until about 20 minutes before serving. Allow to come to room temperature before serving. Do not reheat them in the oven or they will become soft under the prosciutto and will fold over like a bunch of dead flowers. Cook's note: The baking step is optional but if you have a few minutes to do it, it adds just a nice crisp edge to the prosciutto. Mix the cream cheese and basil pesto in a small bowl. Finely chop 1 tablespoon pine nuts and add to mixture. Zest the lemon into the other ingredients, then juice and stir that in as well. Add shredded Parmesan. Taste and add more pesto, lemon juice or Parmesan to your liking. Spoon creamy pesto into serving bowl, drizzle with olive oil and sprinkle remaining pine nuts on top. The creamy pesto can be made up to one day ahead and refrigerated. Bring to room temperature to allow dip to soften again before serving.